It is one of the most scenic places on the western ghats of southern India situated around 380 km from Bengaluru. It is very famous for beautiful green view all around and a spectacular view of sunset. 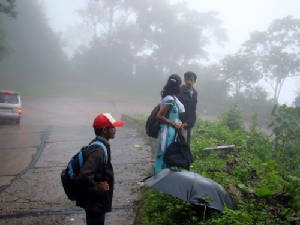 Agumbe is among the places that recieve high rainfall and hence called the Cheerapunji of South India. 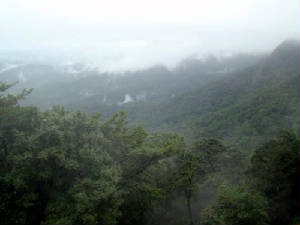 The misty mornings, windy evenings and rainy nights are the delights of Agumbe. The temple town of Sringeri is only 20km away from Agumbe. R.K Narayan's Malgudi days was shot here. It was rainy season when we had been there. All the mountains were covered by mist. Eventhough it was 3pm, it wasn't looking like. The cool breeze and drizzle of rain made us to shiver. If you are going by your own verhicle, be careful in the Agumbe ghat. The private buses of teerthalli-kundapur will be in high speed even in the curvings. No food is available there except some small stalls. The best time to visit would be summer and on any clear day to enjoy the sunset.